Pick up from Ahmadabad R/ Station or Bus Stop and depart for Somanth by surface (approx. 410 kms / 8 hrs). On arrival check inn at hotel. Later visit the temple of somnath one of the twelve jyotirlingas. 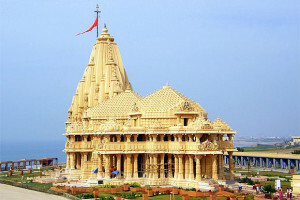 The temple is famous in history for the various invasions on the temple for its wealth. Overnight at the hotel. Morning darshan of Somanth Temple and after breakfast depart for Dwarka to Dwarka approx. 250 Kms/ 5 Hrs. Enroute visit Porbandar. Evening will be at your leisure in Dwarka. Overnight at the hotel. Early morning you will proceed for Ahmedabad approx. 317 Kms/ 5 Hrs. Afternoon reach Ahmadabad and check inn at hotel. Late visit sightseeing of Ahmadabad. Evening drop at R/ Station or Bus Stop for Onward journey.